When I was a wee lad, I was a voracious reader. I read everything I could get my hands on. Inevitably, I discovered the Choose Your Own Adventure book series. At the age of 7, having the capability to change the story just by turning the page was eye-opening, and reading through the multiple endings was inspiring. Ignoring the obvious metaphors to real-life decision-making, the Choose Your Own Adventure book series had such a unique engagement model that I read and re-read each and every book I could get my hands on. For a middle-aged gamer like myself, Forgotton Anne promised a dollop of nostalgia interwoven with the inherent adventure of anime. Let’s get the obvious part of the review out of the way: Forgotton Anne is absolutely gorgeous. There aren’t enough superlatives in the English language to describe just how beautiful the game truly is. Neither screenshots nor videos will do it justice. This is the first release of the startup indie game developer ThroughLine Games, and if the collection of awards amassed by this fledgling Denmark-based developer is any indicator, people love their style. The animation, which is hand-drawn, is best described as 2.5D. The depth of the artistic style is utterly engrossing. The art director and his team utilized shadow and light in exceptionally creative ways to add nuance and to evoke drama throughout the game. There are moments during gameplay where the artwork compels you to stop and take it all in. Forgotton Anne truly is a cinematic experience. While I can go on forever about the artwork, the developers were also trying something different with the plot. The story behind the game is centered on a society of forgotten objects called Forgotlings. These Forgotlings are the objects you and I leave behind every day. They are the one half of a pair of socks that sticks to the side of the dryer, the CD case that no longer has a CD, or the one side of flip-flops that get lost at the beach. These Forgotlings don’t disappear; rather, they join an underground society run by a benevolent inventor and his daughter. The daughter, Anne, is known throughout the society as The Enforcer. Your job as The Enforcer is to make sure no one steps out of line. In order to help with that mission, you wear a device called the Arca, which allows you to manipulate Anima energy throughout the world. In its most powerful form, it “distills” Forgotlings by taking their life force and essentially killing them. Of course, not all is well in this society. There is a band of Rebels trying to thwart your father’s attempt to leave this world and take as many Forgotlings as possible with him back to the world of the living. It’s a story that lends itself well to the stunning artwork. Despite the solid narrative, I found that the plot itself was quite predictable. There were a few major plot twists, but they were easily guessed. In addition, I was looking forward to the capability to alter the plot depending on the choose-your-own-adventure style dialogue choices shown above, but while your decisions alter the story slightly, the plot still ends in the same place regardless of the choices you make. The lack of true decision-based change in the plot left me feeling as if that particular gaming dynamic was little more than a gimmick. I would have been happier with a completely linear story rather than a weak attempt at modular plot lines. Finally, true to pattern, at the end of the game, you are left with two options. In a very obvious way, this mirrors the decision-making present at other pivotal points throughout the game. The main difference here is that either choice concludes the game. As such, the writers made an attempt to leave you with something to think about; they left you with a truly difficult ethical dilemma. This is a theatrical tragedy worthy of the Greeks themselves, and it’s rather refreshing to have a game without a completely happy ending. This type of ending would have been even better if the game hadn’t been bogged down by the mediocre decision points early on. Apart from the plot decision points, there are two other gameplay mechanics that stand out: the puzzles and the platforming. The puzzles are decent, although none of them are show-stopping nor truly challenging. At best, this is a 10-hour game that professional gamers can complete in less than 7 . That should be a good indicator of how difficult the puzzles are. I wish ThroughLine had done some truly innovative things in the puzzle arena; unfortunately, for the most part, there aren’t any genuinely new puzzle mechanics. If they had found a way to integrate the decision points in the plot with the puzzle mechanics, things would have certainly gotten interesting. 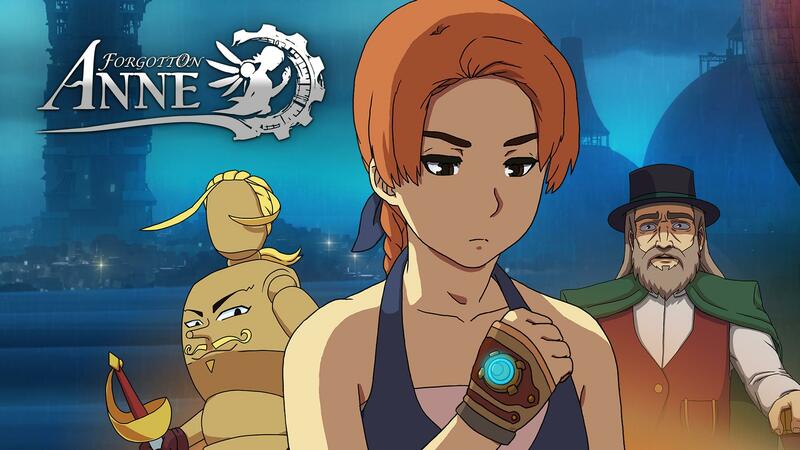 Apart from the puzzles, Forgotton Anne is billed as an adventure platformer. Just as with the puzzles, though, the platforming part of the game is mediocre. Your character has a fixed distance she can jump without the help of a partner or an accessory. As such, there is limited nuance in this gaming mechanic. The controls aren’t pressure-sensitive enough to make this much more than a token implementation at platforming. Both the puzzles and the platforming felt very secondary to what the developers were trying to achieve, as they clearly neglected to put as much effort into creating an exceptional gaming experience as they did in story-telling and graphics. Forgotton Anne is a lavishly drawn “Choose Your Own Adventure”-style video game with a healthy dose of tragic Greek theater mixed into the plot. It’s a wonderful story with unique characters and enthralling illustrations. The story would have been better as a linear plot unmarred by gimmicky decision points. Although I understand the modern-day reality of budget requirements in making video games, I wish they had spent more time on intertwining the plot-line with the puzzles. Be that as it may, I haven’t seen a better illustrated game since Ōkami. That alone makes this a game to talk about.